Up an alley behind Dalton Road, which makes a handy shortcut between Portland Walk, Cavendish Street and Scott Street, somebody’s trainers end up with their laces tied together and slung like a bolus over the telephone wires. I wonder if the owner of the trainers consented to this? There is a plague of this sort of thing and it’s been going on for a few years now, and not just in Barrow. 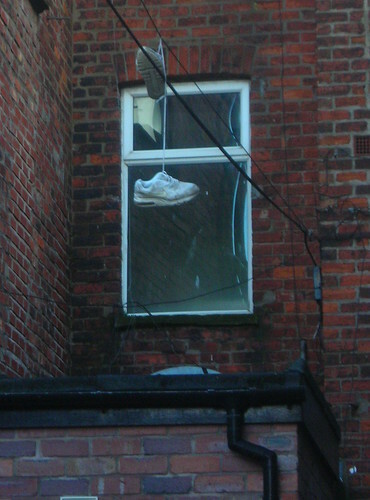 I have the same view out side my office window, a pair of sneakers hanging off wires! Isn’t there one of those urban myths about this? They’re claimed to mark gang territory or the patch of a local drug dealer or something like that. I checked and there is truth to the ‘myth’. Though, I’m assured that the sneakers outside my office window don’t apply! Photo available on request. there’s a lot of this going oin? Wild! I was going to say summat similar to Martin but since he’s said it think i’ll just sneak off to bed.